At some point in life everyone should prepare themselves with an answer to the question “What would you do if you were diagnosed with terminal cancer”? Nowadays it does not matter if you are in your twenties or fifties; you can still be diagnosed with deadly cancer. I have been researching cancer for past 6 years ever since my father died from pancreatic cancer. He passed away within two months of being diagnosed. My father’s doctor told him that he only had a few weeks to live and there was no chance he could be cured. He saw a diagnosis as a death sentence; he gave up without a fight, and let the disease to succeed. James Rhio O’Connor is a great inspiration to me; he was diagnosed with deadly cancer Mesothelioma and given only one year to live, but thanks to his determination and optimism, he outlived his forecast by more than six years. Mesothelioma is an uncommon type of cancer that usually affects the lining of the lungs, heart and abdomen; exposure to asbestos is the only recognized cause. O’Connor found alternative ways to battle this deadly cancer. He changed his lifestyle, prescribed his own treatment and exercise plan and had hopeful attitude towards life. I question myself often, asking what I would do if I was diagnosed with deadly cancer. At first I would certainly be devastated and scared. I would get my family and friends together, ask them for support through the battle, have a good cry, pray to God for wisdom and direction, then pick myself up and start fighting for my life. I would not rush into doing something by blindly trusting my doctor without doing research. In most cases of dire cancer doctors tell their patients they have only weeks to live and their only option is mutilating surgery, chemotherapy and radiation. According to many specialists some cancers respond to chemotherapy and radiation well, unfortunately for most cancers they are ineffective and harmful. I believe the conventional therapies are still used because cancer patients generate billions of dollars annually to the cancer “industry.” It would be devastating for pharmaceutical companies if people would start using natural methods instead of conventional ones. Doctors are good at fixing broken bones but I do not believe they truly know how to cure patients. I’m astounded at the great number of options that we can make of non-toxic treatments for cancer which doctors will not even mention. According to experts and cancer survivors there are many safer, cheaper, and more effective choices to treat cancer. Alternative treatments have higher rates of success than the conventional therapy and cancer patients could be cured without tremendous costs and side effects if it was not greed and politics that operates in our health care system. My first steps toward the cancer treatment would be to research what kind of treatment would be the best. There are many websites available with information on different natural treatments, specific diets and exercise programs.Error! Hyperlink reference not valid. Many websites give you the opportunity to ask questions, be a part of a blog, and exchange information with others. Another research option is finding credible literature. There are many books out there that can be very helpful in finding ways to treat cancer and how to survive the “process.” The books portray what you are going through since the day you are diagnosed, through treatment, until the day you find out you are cancer free. 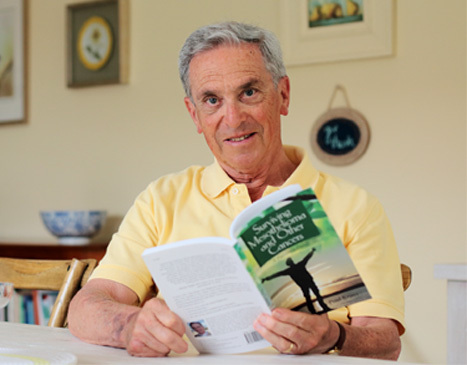 Numerous books are written by cancer survivors who rejected conventional therapies. They can provide motivation and great information about natural remedies and therapies, non-toxic options to treat cancer, explain long and short term side effects, and describe ways to detoxify your body. Books are a good place to start; there are also movies showing many options and treatments that have proven to be most effective from natural medicine to pharmacological therapies. If money were not an issue I would definitely consider going into a clinic that supports natural cancer treatments. Those clinics have doctors whom listen to their patients and work with them to find the best cure possible. Sometimes they advise conventional and natural therapy, but they leave the decision to the patient. If I had limited resources I would search for a doctor in my area that would support my program of self-help. Another helpful step for me would be to join an online cancer support group and communicating with people who have walked the same path. Members really know what you are going through and they also give you essential details on what natural methods they use to help give their bodies the tools to cure themselves. Along with joining a support group I would also join cancer fundraisers. This will give me the opportunity to help people with similar problems. I will also have a chance to talk to limitless number of cancer fighters, survivors, families, researchers, nutritionists, nurses, cancer doctors and cancer experts of all kinds. I would begin my cancer treatment regiment with complete re-evaluation and change in my eating habits. Nowadays, our bodies are contaminated with toxins accumulated by eating unhealthy diet, which do not supply our bodies with essential nutrients, required to build up an immune system in order to fight cancer. First it is important to realize the cancer grew for a reason, and in order to get cured, this reason needs to be addressed. The cancer causing factor has to be eliminated and given the right conditions the body will become stronger and it will be able to heal itself by restoring the immune system. I would not see my new eating habits as a strict diet, but reconstructing the way I regard food and a complete change of lifestyle. Raw food vegan diet, fruit and vegetable juices, eliminating sugars, processed foods and animal source foods will help to alkalize my body, remove toxins, and fight the cancer by itself. Diet has to be tailored to each patient’s need, but no matter what diet we will stick with the food has to be organic, whole grain, non-processed, no preservatives, no MSG, no added salt, and hormones-free. Along with the appropriate diet, I would also turn into nutritional and herbal therapy. I would never rely on just one treatment to cure my cancer; I would take plenty of tablets and capsules of coenzymes, megavitamins, antioxidants, minerals and high-dose vitamins. Another very important step in a natural cancer cure would be a body detoxification. Cleansing of body is very important to eliminate the deadly toxins and get rid of cancer. The way to endure cancer is to treat the root causes of the problem rather than just treating the symptoms which are the growths. I would also take my new regimen even a step further; I would go to see an osteopath known for more holistic approaches to health. I believe the mind plays a huge part in cancer recovery. Cancer patients and their families can never quit. They have to keep going forward no matter how complicated or disappointing things might get. Not giving up may be the hardest thing, when faced with the prospect of dying, but they must face and conquer over fear. Many therapies and workshops are available, such as psychological counseling, support groups, Japanese Reiki healers, yoga, meditation, relaxation workshops, visualization, spiritual counseling. Developing a new outlook on life is crucial, be ready for obstacles coming your way, don’t give up hope, and tell yourself you can overcome the illness. In order to be successful more than one approach has to be used to treat cancer. There are many alternative treatments than most people can imagine. If I would have cancer I would do anything to survive it and get cured even if it required doing the most bizarre thing including drinking breast milk, oxygen therapy, coffee enemas or getting infected by the oncolytic virus. I’m not a cancer patient but if I was diagnosed with dire cancer, I would be on the mission to cure myself. I would be greatly motivated by Rhio’s story and if I felt like giving up I would think about his battle with cancer and I would fight to the best of my ability. I would do an extensive research to find information about alternative ways to beat the cancer. The knowledge would give me confidence, strength and will empower me to go forward. I believe cancer is a disease that can be eliminated by self help; it’s likely to achieve a cure for cancer. Although there are no guarantees, I’m convinced natural cancer treatments would improve my chances of healing. There are so many sources available; everyone should investigate the options, instead of blindly following doctor’s orders. I’m not afraid of dying; everyone has to breathe their last breath sometime, but there are still so many things I want to accomplish in my life and I am not quite ready yet. I would keep positive attitude, surround myself with family and friends and find ways to battle cancer.